As a Google employee recently said, "Google Maps is evolving from a driving directions and business search tool, to a comprehensive representation of all the world's information, on a map." That's why Google Maps started to integrate different layers of information when you search for an address and it added a new "More" button to enable layers for photos and Wikipedia articles. Google Maps now includes in search results personalized maps, geolocated content from the web and mapped web pages. There's a new option to search for real estate: click on "show search options" and select "real estate" from the drop-down. The search results don't seem to be powered by come from Google Base. Google shows structured information about houses and lets you refine the results by price, number of bedrooms and bathrooms. Even if there aren't too many advanced features, it's interesting to see that Google Maps wants to index all the information that could be displayed on a map. Many real estate sites use Google Maps API and the first Google Maps mashup was HousingMaps, a site that displays Craigslist housing listings on a map. Last month, Trulia was one of the first sites that integrated Google Street View "to add efficiency to the real estate search experience and help home buyers discover more information about particular neighborhoods". I think the Real Estate search has been there for quite a while, but under "My Maps" where it shows up twice, once as Created by others, and once as Created by Google. Looks to me like these are all essentially providing the same information, but it is not clear what the source is. I'm sure the people at MLS who sell this data as a subscription service are having nightmares over it. Anybody tell me what sort of feed the realtor's site provides for Google to read/index? About time - and to think of all the Real Estate sites that have been using Google Maps and gifted them with a few years of insights! You're right, but now it's easier to access. The same goes with the new "More" button that lets you enable additional layers (photos, Wikipedia articles), which were previously available in the mapplets directory. I don't think this feature uses Google Base. The results aren't the same and Google Maps links to sites that have RSS feeds. As you might know, Google Maps indexes KML files and feeds that include locations. It might use other data sources but does use Google Base data. For the search in the image on the post 'duplex near ny' listing J is directly from a Google Base hosted item. Just a simple comparison between Maps and Base for the query [fsbo energy efficient] restricted to the US. So i don't know where your getting 2 from. The API is restricted to 1,000 . There are also factors surrounding differing relevance results between the API and the Google Base search tool. Google says you are right and the data comes from Google Base. I updated the post. This feature does not provide a serious buyer specific information about homes in the area, It's meant to be used by speculators. Where exactly is this data. How can I know how long this home is being listed for or look at 5+ photos of the property, or better yet how can I find room sizes or if it has a pool or 2 acre lot. Try performing a real search on my webiste or by contacting a local realtor for a detailed MLS Listing.. If Google were to get more listings (which I am sure they will), I think a lot of the third party sites would be in trouble. RE: If Google were to get more listings (which I am sure they will), I think a lot of the third party sites would be in trouble. Google Base listings are coming from Realtors, the "first parties," so no quite sure what "third party" sites may be: Realtor.com? Until narrower searches are consistently possible, and users are able to refine their searchs to meet more criteria, Google Base will remain a cool place with little actual utility in the real estate world. Also, despite the fact that placing listings on Google Base is free, very few brokerages are taking advantage of it ... this even despite the fact that Google Base (currently) redirects the user to the brokers' own websites! Of all of the listings showing in, say, the Dallas area, most appear to be those of individual agents whose listings have been fed to Base by their virtual tour companies. NONE of the "top ten" brokers in the area are represented in any number. Thanks for the tip Duke, I'm in Australia and will check out the efficacy of using Google Base over here. A revolution in the world of real estate I would say. Google Maps is the greatest thing online real estate has ever experienced. As a result, Google real estate is not so useful for us in Malaysia, yet. Suggest Google Maps Real Estate to accept property input from users. What do you think? I think this is a great move by the google giant. we are a realestate operator and we have started to list our properties on google, while it advertises the property for us the buyers still come to our website to contact vendors and we find that its a form of free advertising for us. Helpful dialogue...will study and learn and post on our own real estate applications. I have added over 400 properties as an estate agent in France to Google maps. The properties have been accepted by Google's syatem but they do not appear anywhere. Is there a long time lapse (I uploaded them 14 days ago)? Or am I doing something wrong. Would be nice if they also included recent sales data. Any idea if there is any upcoming updates to realestate search. seems like it has been stagnet for 18months+?? Google map is now prove to be helpful for the potential buyers and sellers as now real estate search options have been added to it apart from driving directions and business search tool. 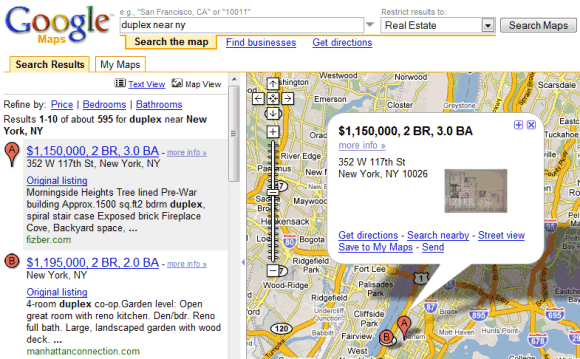 That is why so many real estates now using Google map API in order to provide more information to buyers. This site will prove to be helpful for the people who are dealing with properties and who are interested in buying or selling it. For any enquiry one can call 800-232-2343 or 0120-4338222. I think this has been here. Several of our web platforms have been integrating this same for several years now. I love Google maps! I find their routing program to be more accurate and flexible than any other. Now if only Google Earth was more current. R.I.P. Google Real Estate Maps option. It has been removed for reasons which are not being disclosed. Fortunately Yahoo Real Estate still exists and is a good starting point to explore what properties are available around the country(USA). Is there anyway to get the phone numbers of the listed properties or even doing a proximity search on google maps and get phone numbers for resiendtials for businesses? This services is no longer available.Google stopped it a year ago. I think it was removed because you could search "Foreclosure" and see milions of red dots spread throughout the U.S. The data was too close to reality for some! Agree Tim, Is there any alternative of this service then please tell. The integrated street view is so helpful for finding homes. I used it when I bought a condo not long ago. Google map is always very helpful in searching locations. Thanks for sharing this article with us.